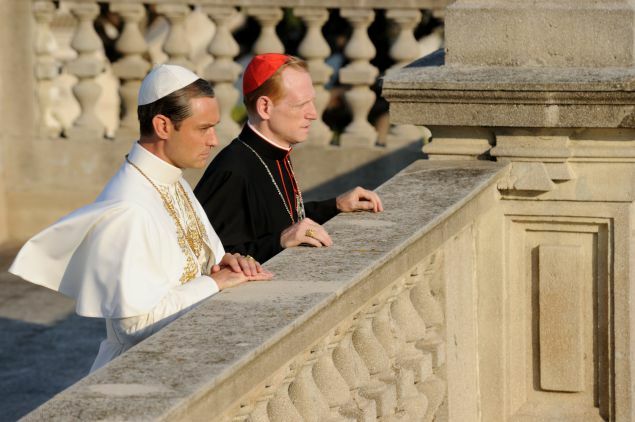 No Blogging for Old Men: The Small Screen: The Young Pope "Episode 7"
I don't really have an eloquent or clever way to start off my thoughts on the seventh episode of The Young Pope or the show itself. I just want to say, this show is terrific. I fell behind this past week, what with life getting in the way and all, but it truly was a pleasure catching up tonight and I am going to move right on to the eighth episode as soon as I finish this quick write up, and I do mean quick because after that ending I need to know what happens next. - At times during this show, the camera work is so artfully composed and framed, it's impossible not to admire it. - Between that camera work, the brilliant screenplay and the performances, it's really quite amazing how The Young Pope has managed to subvert expectations based on what seemed like a silly premise on paper. I mean, besides the occasionally scene that can feel a little tonally out of place, and those moments are quite rare, there is nothing silly about this show. - Initially I thought that the concept of this show and the way it looks deep at the ugly heart of the church and its key members would be considered blasphemy from those viewers who would be offended, but the more I watch the more I realize it isn't a criticism of religion, it's a commentary about the way power and status matter more than faith in the Lord himself and how wrong that is. One of the biggest questions at this point of the show is whether the Pope even believes in God, which is a remarkable thing to ponder even if it is just a fictional show. Whether he believes or not, he certainly likes to wield his power and use it to push his beliefs.